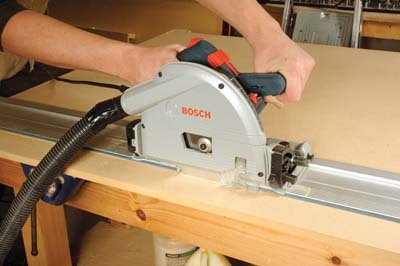 Bosch has a great reputation for powertools, and has brought out a new board-cutting saw - with guide rail - in their Professional range, so we had to test it. 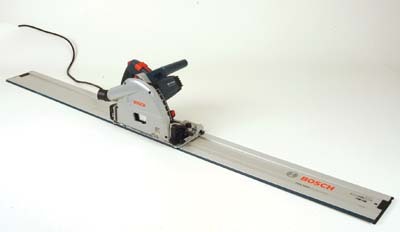 I've used the Mafell variety of this saw before, which was very good, so the Bosch has a lot to live up to. The saw has some interesting variations on the Mafell guide rail system, which I'll outline. For one, the blade doesn't have a retractable guard, instead, the whole body is sprung, so the saw blade is designed to plunge into the work. It took a little while to get used to the action, but when I did it was simplicity itself. This plunge feature obviously makes it a perfect saw for dealing with floorboards after they've been fitted. Just like the Mafell guide system, this is easy to use. Simply locate the sole plate in the guide - which has a non-slip underside - so doesn't need clamping, raise the trigger lock, which also releases the plunge mechanism, and plunge the saw in. The saw cut MDF and a hardwood board, with consummate ease and little noise, producing a clean edge. The depth of cut adjuster has two settings, one for a cut with the guide rail, and one without the guide rail. A great touch. The tilt arbor is easy to use, with a clear scale on it. This is designed so the blade always enters the workpiece at the same point. Bosch has a nice system for blade changing. With the saw switched off, you lift a lever sited above the trigger lock, and plunge the saw forward. The blade then locks in place, which reveals the arbor for attaching and detaching the blade. With the blade in this position, the trigger is locked off, for safety, and the lifted lever reveals the spindle lock. It sounds very complicated, but is simple to use, and very safe. I found it to be a joy to use. It's accurate, cuts very well, and has features to keep the pickiest pro happy - a great bit of kit for the workshop!